In 1492, Angelo Poliziano published his Lamia, a praelectio, or opening oration to a course he would teach that academic year on Aristotle’s Prior Analytics at the Florentine university. Having heard murmurings that he was not philosopher enough to teach the Aristotelian text, Poliziano strikes back, offering in effect a fable-tinted history of philosophy. More than a repudiation of local gossip, the text represents a rethinking of the mission of philosophy. 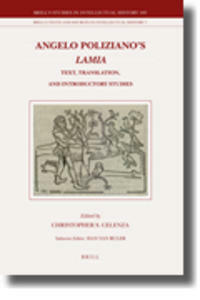 This volume offers the first English translation, an edition of the Latin text, and four studies that set this rich example of humanist Latin writing in context.